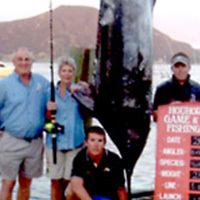 The New Zealand husband-and-wife team of Eryn and Guy Jacobsen is among the very best in light-tackle, world-record angling. Each has earned 11 records-- (22 total)-- for striped marlin, Atlantic and Pacific blue marlin, swordfish, Pacific big eye tuna, mako shark, and bronze whaler shark. With the exception of Eryn’s 264-pound, eight-ounce striped marlin taken on 130-pound line, all of the couple's records have come on 20-pound or lighter tackle.